Airbnb just launched their experiences in Goa recently. So we thought that if you are all foodies like us, then a lovely day spent exploring, learning about & indulging In Goan Portuguese food and it's history would make for a perfect treat on your next Goan holiday. A cute blue coloured cottage in Vagator is where this experience is hosted. The fact that it is hosted by Odette, who herself is an award winning author of cookbooks and history of Goan food books, makes it even better. 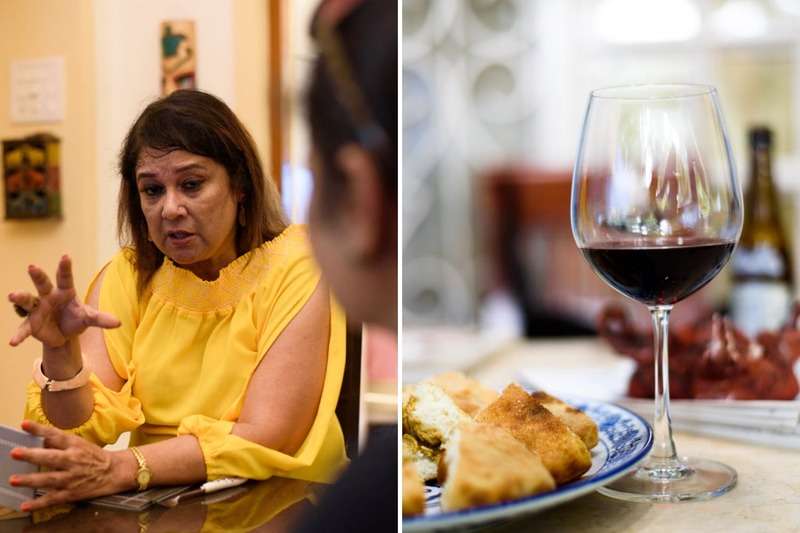 She is the foremost expert on anything to do with Goan food in India and her wonderful stories about how Portuguese food travelled to India will keep you regaled for hours. We started off with a lovely glass of wine whilst sitting at the verandah, nibbling on fresh Poi stuffed with a delectable fish paste, while listening to Odette tell us all about the dishes that she had prepared, and the history behind them. The Rechaedo, Caldin, Balchao and Almonas are what the experience focussed on. Most of these dishes, are not found in restaurants and even if they are they will not be prepared how Goan homes still prepare them. What we loved most is that, you can finally learn why a Xacuti curry in the northernmost part may taste different from the one in the southernmost part of Goa. We even got a live demo of the Caldin fish curry preparation, and a recipe handout to take home with us. Post which, we all sat around the table enjoying a hearty meal of the Caldin fish curry, a stuffed fried fish in the Rechaedo masala, a fried fish done the traditional Cafreal style instead of a gravy (you will get to know why the Cafreal is supposed to be a grilled dish instead of with gravy as served at most restaurants) and the local boiled rice to polish it all off. The traditional Almonas a type of a fish cutlet was a delight too. As a treat, there was even a Caramel Custard to end things on a sweet note. If you are a vegetarian or not a fish eater, then be warned that this experience may not be for you. But if you are really interested in learning about the Portuguese influence on the food in Goa, then this experience will be worth it.